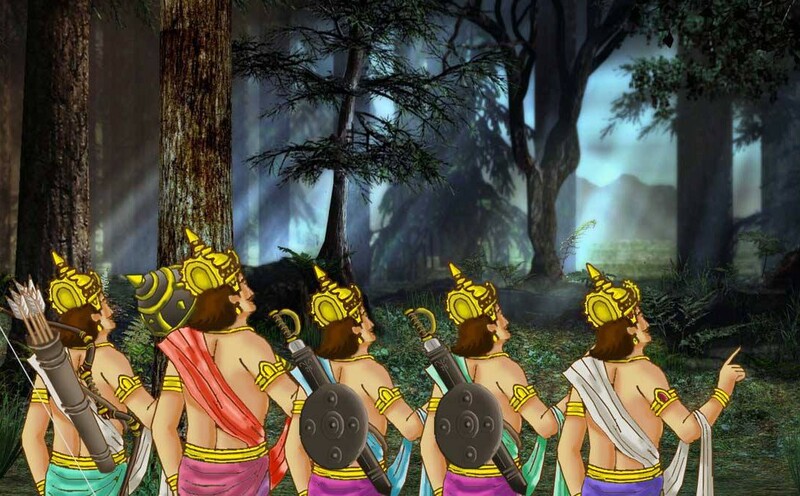 The Pandavas during the time of their exile once walked into the forest of Romarishi . Romarishi was a Sage whose body was covered with hair and his beard was so long that it spread like a carpet into the entire area of the forest . There was a sacred tree in that forest yielding a very special type of fruit which, once tasted by a person, would relieve him of hunger and thirst for years and years. But the fruit was not to be plucked, it was to be eaten only when it fell down on its own. One day Dharmaraja and Draupadi chanced to come near the tree. Draupadi was very much tempted to taste that luscious big fruit hanging from the tree. Dharmaraja shot an arrow and the fruit fell on the ground. He went to take the fruit with his hand. It was so heavy that he could not move it . Dharmaraja tried to lift it with all his strength using both his hands but he could not lift it . Draupadi also tried but in vain. In the meantime, Arjuna arrived at that place. He tried to lift the fruit but could not succeed. All the three tried to lift the fruit but it would not move. The two younger brothers Nakula and Sahadeva came and tried to lift the fruit but they too could not succeed . Finally came the mighty hero, Bhima . He asked the others to keep away and said: “I will lift it “ . But even Bhima failed. Meanwhile the hair of Romarishi which had spread all over the area, began to stir because when these six people were trampling about to lift the fruit, the strands of hair were being trodden and pulled. He realised that some one must be trying to steal the fruit . He had become furious. His long hairs started coming together and coiling round the Pandavas to tie them up. Draupadi realised the danger and as always in times of danger immediately prayed to Bhagavan Shri Krishna . Bhagavan appeared before them. Draupadi fell at His feet and prayed to Him for help. Draupadi and Pandavas promised to obey his orders.Shri Krishna went towards Romarishi’s ashram and instructed them to follow him after sometime. In the meantime, Romarishi was so much enraged that he had actually started to walk towards the tree to curse the poachers. Just then Bhagavan Shri Krishna entered the ashram. 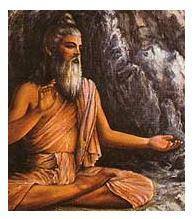 Romarishi fell at the Lotus Feet of the Bhagavan . He was overjoyed to see Shri Krishna . Shri Krishna engaged him in discussing certain spiritual matters till the Pandavas arrived . As soon as the Pandavas along with Draupadi reached the ashram, Shri Krishna hurried towards them and fell at their feet . The Pandavas were feeling embarrassed but remembering the Lord’s command, kept quiet . Seeing Bhagavan Shri Krishna fall at the feet of the Pandavas, Romarishi also fell at the feet of those visitors . Then Shri Krishna asked them to come into the ashram . He introduced them to Romarishi . He praised the virtuous Dharmaraja, valiant Bhima and Arjuna and the intelligent Nakul and Sahadeva, and above all, the devout Draupadi. Romarishi by that time totally forgot about the fruit and the poachers . Krishna informed Romarishi that the Pandavas were the people who were tempted to taste the fruit being unaware of the unique nature of the fruit . By eating the fruit the Pandavas were able to live without hunger for a long time!! Taking shelter at Krishnas lotus feet can save us from all dangers we face in our lifes. Diference between devotee as Pandavas is that they alwasy turn to Krishna in all times, and not like ordinarily people who turn to power of therie strenght, relatives, money or goverment.